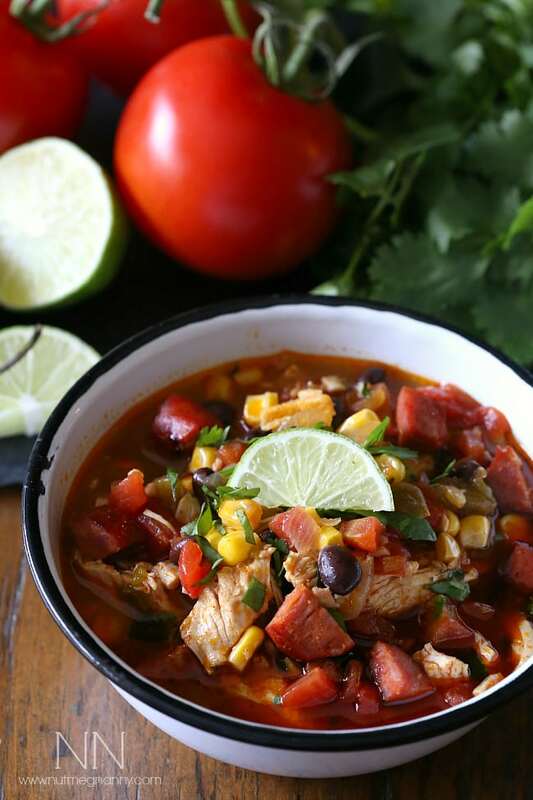 This spicy chicken lime soup is packed full of chicken, chorizo, black beans, tomatoes and homemade roasted hatch green chiles. This soup is flavorful and perfect for summer. Are you sick of my Southwest flavors yet? Are you sick of hatch green chiles? I really feel like I should have nicknamed this week “hatch green chile week” since I taught you how to roast your own hatch green chiles and gave you a recipe for pork chile verde and now this soup. It’s all peppers up in here. Well lucky you, you’re at the end of this Southwest takeover for at least this week. Even though I just bought like 400 poblano peppers from the store today. I couldn’t help it. I had the crazy desire to stuff them with some sort of black bean, chorizo and cheese mixture. Yeah, you should follow me on Instagram because I’m making them tomorrow and it’s going to be so awesome so I will probably share a picture. Wait…am I allowed to say something I’m about to make is going to be awesome? Is that too arrogant? Eh. I’m going with it. It will be awesome. Trust me. So as I’m typing this post I’m listening to the classic country station on Pandora and the song “Lookin’ for love” just came on. It always reminds me of one of my favorite childhood movies – Urban Cowboy. Who else loves that movie? I’m imagining it was probably inappropriate for a 7 year old child to watch a movie based on a fast marriage, cheating, drinking and mechanical bull riding BUT I loved it. I had this dream of moving to Texas and finding myself a cowboy and a hanging out in a big bar where I could win a gold medal in the mechanical bull riding Olympics. Ok, I’m sure there are no mechanical bull riding Olympics but I was 7 so cut me some slack. I’m sure you are wondering what my love for Urban Cowboy has to do with this soup and I can tell wholeheartedly that it has absolutely nothing to do with this soup. It was just a random thought that popped into my head as I listen to super old country music…that is probably weird for a 32 year old woman to listen too. However, if I were going to stretch it to make it work I could say this soup would probably fit in in Texas. I mean I have only been there once but I feel like they could get down with a delicious soup like this. Plus it uses some more of my freshly roasted hatch green chiles so who doesn’t love that? I titled the soup spicy but don’t worry, it’s not super spicy. It has the perfect balance of heat, sour and meaty deliciousness. Ha. I just actually typed out meaty deliciousness. But in reality the best part about this soup is that it only takes just about 60 minutes to make and is perfect even in the middle of summer. That’s right. I’m a summer soup lover. In a large soup pot set over medium heat, add olive oil. Once the oil is hot add in onion and jalapeño. Once the vegetables are soft, add in diced hatch green chilies, diced chicken breast and chopped chorizo sausage. 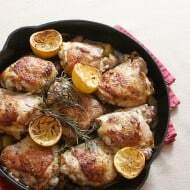 Cook until the chicken is no longer pink on the outside. Add in garlic, chili powder, smoked paprika and cook for 30 seconds until fragrant. Add in tomatoes, black beans, corn kernels and chicken stock. Add more chicken stock to reach desired consistency. Simmer for 30 minutes. Stir in lime juice and the majority of the cilantro. Let simmer for 5 minutes. 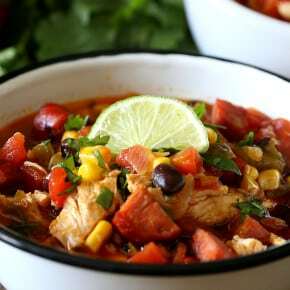 Serve soup in a large bowl sprinkled with remaining cilantro and an optional lime wedge. this is so colorful and undoubtedly full of flavor too–i love everything about it! Woohoo! 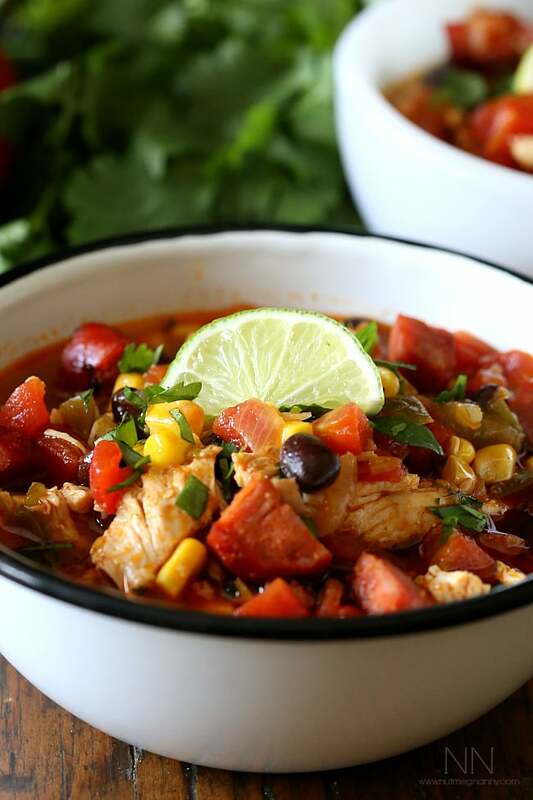 I’ve been loving southwestern week – I know this soup would be a family favorite in our house! I’ll never get tired of southwestern flavors. They are some of my favorite. This soup looks fantastic too! What a lovely soup with some great, zippy flavor. Omg, Urban Cowboy was my mom’s fave so I totally remember it being on in the background while I played. I don’t think I’ve ever sat down and watched it though. I probably should. I’M SO EXCITED FOR SOUP WEATHER! The cold needs to hurry up. i definitely want to make this! No!!! I’m never sick of Southwest flavors! Keep ’em coming!! This soup looks so comforting, I would eat two bowls. I am NEVER tired of southwest flavors! Keep em’ coming! This soup is definitely going on my list of foods to make! And with all of these wonderful food blogs, that list has grown quite long! I’m loving all the hatch chile recipes lately! Bookmarking this post for cooler weather days for sure! This soup sounds great, a perfect transition into the upcoming fall weather. This looks so beautiful! Love all those colors and rich flavors. 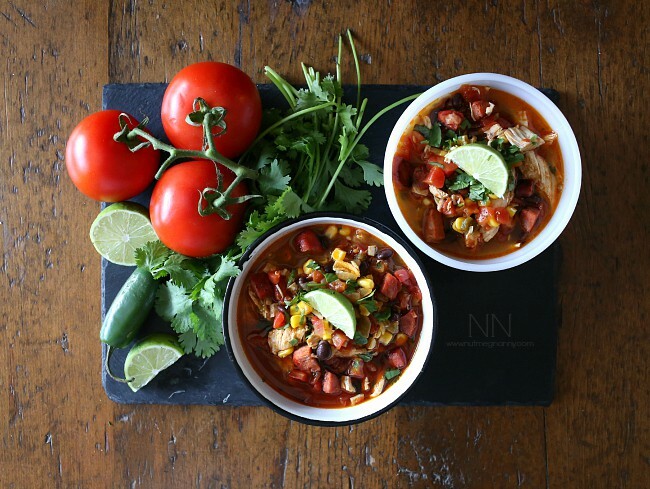 What a wonderful soup, love that you added chorizo to this! I’m all over this soup! Every wonderful flavor in one bowl. How I wish I could get my hands on some hatch chilies. I love soup all year round and this one looks fantastic! I am making this soon! The colors in your photos are simply stunning!!! And I have to say anything with lime is right up my alley. I’m not quite ready for soups yet… but when I am? This one is printed and on the top of the pile! This soup sounds incredible! 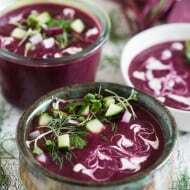 I’m a summer soup lover as well! Absolutely gorgeous!!! We’re on a soup kick these days so this one’s coming up next!! Wow that is colorful! My brother loves all of those things, he’d be so happy f I made this for him! Soup with chorizo, I’m all for this! This cooler summer (well except for this week) has been getting me in the mood for soup again. Holy cow, Brandy! These photos are absolutely stunning! 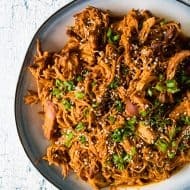 This really does look delish and I think you can keep those Southwest flavors coming because I sure do want a bowl of this! PS: I’ve been crushing on your photos, they’re beautiful! I love that you keep incorporating those hatch chiles in your recipes. So flavorful. I love a soup that borderlines a stew with all that chunky texture. Your flavors here are amazing! 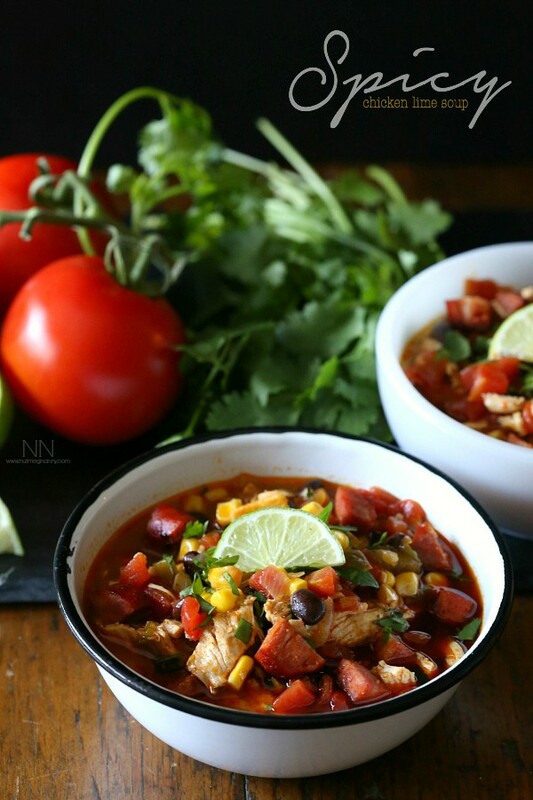 This looks absolutely amazing….beans, chicken, lime, all in a soup,.that’s my favorite combo! Good thing fall is coming soon! veganized it with beyond meat and chorizo. Is it possible to get the nutritional information on this soup? Thank you! Hi Dea! I do not do nutritional information on my dishes but you can find a few calculator online 🙂 Hope you enjoy the soup! Thank you for mentioning Hatch Green Chile! We would love to send you a free box of our Hatch Green Chile as a thank you. If you are interested, please send me an email.